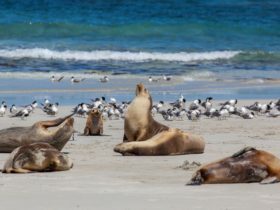 Kangaroo Island Outdoor Action offers customers a variety of high quality, action based, outdoor activities with the opportunity to explore otherwise inaccessible parts of Kangaroo Island. 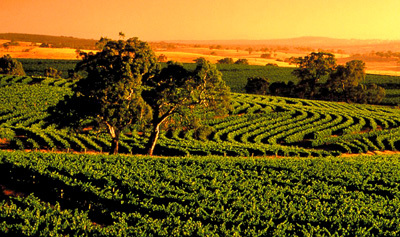 Experience the natural beauty that Kangaroo Island has to offer by combining adventure activities with nature. You can ride quad bikes through 500 acres of winding bush land trails, open grassland and rocky terrain, hire sandboards or toboggans and surf the massive sand dunes at Little Sahara. Escape the crowds and make your own tracks on a guided Fat Bike Tour, the best way to discover this part of Kangaroo Island. Ultra wide, low pressure tyres float over sand giving you an easy ride over the dunes at Little Sahara. Tours adapted to your riding style and fitness level, electric bikes available. Take a guided kayak tour, or hire a double or single kayak and paddle up the relaxing Harriet River at your own pace. All outdoor adventures are for everyone – all ages and abilities, and suitable for the whole family. Guided tours from 1.5 hours to 3 hours, full day packages also available. The most popular tour for those who want to experience more terrain and more action, the two hour All Terrain Adventure gives you the opportunity to ride faster for longer and see more of our beautiful countryside. With more time on the quad bike this tour is ideal for those wanting to gain confidence over more terrain, or for the already experienced rider wanting to extend the action and adventure. FREE Private Tour Upgrade for all families with children 11 years and under. Suitable for beginners and experienced riders. You are guaranteed to see kangaroos up close int eh wild. Combine the experience of riding a quad with the opportunity to observe native animals in their natural environment. Suitable for all ages, beginners and experienced riders. Participants are fitted out with safety gear and instructed on the safe operation of a quad bike, and children as young as six can ride their own quad. We also offer the option to tour as a passenger and ride in the lead vehicle with the guide. FREE Private Tour Upgrade for all families with children 11 years and under. Looking for some peace and tranquillity on your holiday? Paddle a kayak for up to five kilometres on the beautiful Harriet River. Glide past a variety of birds and see fish jumping as you meander up the river, enjoying the beautiful scenery. Our kayaks are the latest sit on top design for your safety and come with backrests for comfort. We help you to launch the kayaks on the river which is just 400 metres from our office here at Vivonne Bay. Our single kayaks are swift and streamlined, making them a pleasure to paddle on your own or alongside friends for company. Our double kayaks have a wide hull for stability, which make them ideal for couples or families. They are easy and fun to paddle and can seat up to two adults and two small children. Paddles and life jackets are provided. Hats, sunscreen and sunglasses are recommended. A great introductory tour for families with children who want to get their first experience of quad biking. 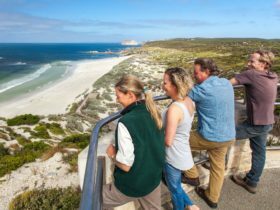 Kangaroo Island outdoor Action has a range of smaller quads suitable for children as young as six years old and tailor each tour to fit their ability. You will be guided across open grassland and on winding trails through native bush, building your skills and increasing your confidence along the way. Lots of fun for first time riders. Participants are fitted out with safety gear and instructed on the safe operation of a quad bike. We also offer the option to tour as a passenger and ride in the lead vehicle with the guide. 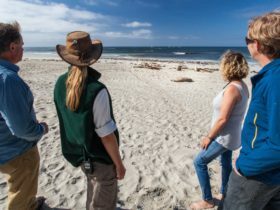 No experience is necessary, each tour is tailored to the participants’ abilities. First time rider’s and experienced riders are welcome. 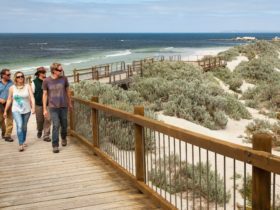 You will be among the few adventurers to discover one of Australia’s Top 100 surf beaches located not eh rugged and otherwise inaccessible south coast of Kangaroo Island. Explore the Harriet River with an experienced guide. 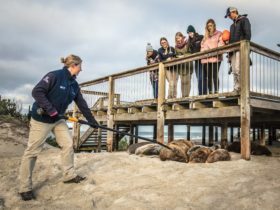 Tours begin with instruction, with tours tailored to your interest and ability. Suitable for beginners and experienced kayakers, single or double kayaks available. Escape the crowds and make your own tracks on a guided Fat Bike Tours, the best way to discover this part of Kangaroo Island at your own pace. Ultra wide, low pressure tyres float over sand giving you an easy, cushioned ride. Ride as hard or easy as you like as you follow the guide along our bush trails to the edge of the Eleanor River. Follow the river and spot koalas and eagles in the trees, before you head over the ridge to the dunes of Little Sahara. Your tour is adapted to your riding style and fitness level. See wildlife up close and amazing landscapes. Unlimited photo opportunities. Electric Fatbike upgrade available, see more with less effort and let the bike do the work. Private Tour Upgrade, just you and your family with the guide. Your tour is 100% tailored to your interest and pace. Minimum age is 8 years, riders must be able to ride without trainer wheels.